Whole30 Restaurants: How to Eat Out on Whole30 Without Starving! Let’s face it, eating out while on Whole30 really is not cake walk (pardon the expression if you’re still in sugar-craving stage). However, in some situations you won’t be able to avoid eating out at a restaurants. We’re here to help you get through it and make sure you survive and stay compliant! Please note: We’ve done our best to provide guidelines and recommendations for the best Whole30-friendly restaurants, but you’ll always want to double-check and ask your server questions to ensure that the meal you’re eating is Whole30 compliant. This guide was made in March 2016, and while I’ll do my best to update it, recipes may change so please use this guide at your own discretion. Update: Originally I had included Panera Bread’s chicken as compliant – I have been corrected, it does contain sugar in the marinade, so that’s out! No subway meats are compliant either. Finding restaurants where you can eat out while staying Whole30 compliant can be hard, but we have a few recommended spots where you should be able to find some compliant dishes. When it comes to quick and easy food, these fast food spots are your best bet for staying compliant. Subway. Subway offers build your own salads which can allow you to create a Whole30 compliant fast and easy food option. Try a spinach salad with tomatoes, onions, peppers, and vinegar. No Subway meats are allowed though. Whole Foods Hot Bar. The hot bar at Whole Foods allows plenty of pick and mix healthy options, so be sure to stop by there when you need something fast and Whole30. Chipotle. Chipotle is a favorite fast food options for Whole30 eaters. Go with a carnitas salad (carnitas is the only protein at Chipotle cooked in sunflower oil, as opposed to rice bran oil), avoid the rice and beans, and then heap on the guacamole and salsa (all salsas should be fine, minus the corn salsa). Note that if you cut out the meat all together, the guacamole should be free. For more details, check out Chipotle’s ingredients list. Also, as of January 2019, Chipotle’s fajita veggies are now Whole30-compliant, as they’ve stopped using rice bran oil and now use sunflower oil for the fajita veggies – so go ahead and get those veggies! Boloco. Boloco is another great choice, working in a build-your-own style similar to Chipotle. Boloco’s chicken marinade does seem to be compliant, consisting of canola oil (allowed in small quantities, mainly for restaurant eating), garlic powder, onion powder, salt, pepper, celery seed, and paprika. See the complete Boloco ingredient list here. Panera Bread. Panera Bread has some decent salad options that are Whole30 compliant. Scour the menu for compliant dishes like the Cobb Salad With Avocado with lettuce, tomatoes, hard-boiled eggs, and avocado. Ask for no cheese, no chicken (Panera Bread’s chicken marinade has sugar in it), and no bacon, plus ask for plain olive oil and vinegar dressing, or ask for no dressing and bring your own. It’s also worth noting that the iced Plum Ginger Hibiscus Tea is compliant, as is the brewed iced tea and iced coffee. Five Guys. Five Guys burgers are compliant – as noted on their website, “We do not add anything to our products. Our burgers are NOT seasoned, they are simply 80/20 ground beef.” You’ll just have to order a lettuce bun and stick to veggie toppings (jalapeno peppers, green peppers, onions, lettuce, tomatoes, pickles). Leave out the mushrooms as they are reported to have high fructose corn syrup on the Five Guys nutrition/ingredient sheet. Their hot sauce is also compliant! These spots aren’t quite as fast – they’re more sit down spots, but past Whole30-ers have found these restaurants to have some compliant options (although you may need to do some fiddling). Ruby Tuesday’s. At Ruby Tuesday’s, the salad bar is your best buddy. Just avoid the usual culprits of cheese, croutons, and stick to vinegar and compliant oil for dressing. Golden Corral. Golden Corral’s buffet style eating makes it easy to pick and choose compliant dishes. The salad bar provides ample greens. Be careful with meats, as the steaks usually come with sugar in the seasoning. However, some Whole30-ers were able to successfully order dry steaks. Veggies were simply steamed, and potatoes and sweet potatoes were also compliant. Chili’s. For Chili’s, try aiming for steaks (ask for them dry) and steamed veggies. Also try burgers with no buns (make sure to ask about how burgers are cooked), or grilled chicken. Salmon dishes and other fish may be OK, but you’ll have to ask to make sure. You could also try the fajitas, minus the tortilla, sour cream, and cheese. Applebee’s. Applebee’s Ribeye and NY Strip are the only two steaks that aren’t cooked in soybean oil. For seafood, ask about the Garlic Herb Salmon. For sides, go with the steamed veggies. Hot Pot. Hot Pot is another type of restaurant where you should be able to easily stay compliant. For those who haven’t eaten hot pot before, it’s when waiters bring a large pot of broth to your table and place it on a built-in stovetop at your table. Then, fresh, raw meats and veggies are brought to your table (you select what ingredients you want). Then, you place the raw meat and uncooked veggies into the boiling water and watch it cook before your eyes. The only real room for error is the broth – many hot pot broths are simply water with spices, but you’ll definitely want to get the specifics concerning what is in the broth to verify that it is indeed compliant. Steakhouses / Outback Steak House / Texas Roadhouse. Most steak houses have an option where you order your cut of steak plus two sides. For your sides, order steamed veggies and sweet potato. Ask for no oil, butter, or seasoning (be specific about this since many steak houses will put a pat of butter on steaks). Create-Your-Own Mexican. Any place where you can choose your own ingredients is a plus. Stick with grilled meats, veggies, and healthy fats like avocado. For salads, look for oil and vinegar dressings. Check ingredients lists before you go. 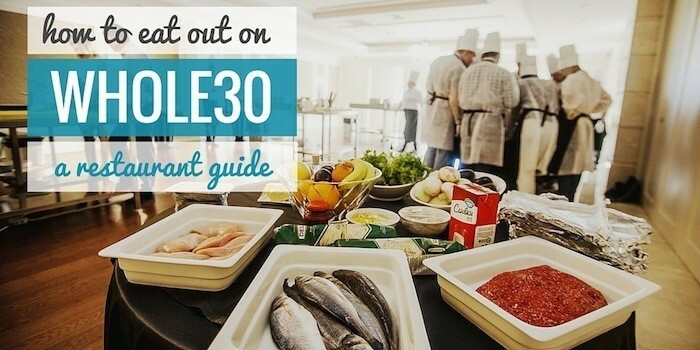 Navigating a huge menu on Whole30 can be tough – here’s what to look for on restaurant menus that will give you the best chances of staying compliant. Meat + Grilled Veggies. As a general restaurant rule, seek out dishes that involve meat + veggies. For meat, look for steamed or grilled seafood, or lean cuts of meat (such as sirloin steak). The next best bet is grilled chicken (no skin), fattier cuts of red meat like ribs or ribeye steak. Burgers with no bun work here too, but aren’t always the best option due to cooking method and oil. Avoid any skin on chicken, sausage, bacon, and (of course) anything fried. Salads. Salads are often a great way to stay compliant while out at a restaurant. However, beware of croutons, cheese, and dressings – get either oil & vinegar dressing, or bring your own Whole30 salad dressing. Many restaurants offer salad bars – seek these places out! Stir Fry. Stir fries can be a good menu options as along as you are very clear about the oils used in cooking and avoid any non-compliant ingredients. Hamburgers. Hamburger sans bun is a pretty readily available option at most restaurants. Get your burger with lettuce instead of a bun, and with plenty of veggie toppings. It’s smart to also ask if the burgers contain any bread crumbs or flour, as some restaurants add these to burgers. Baked Potato. Baked potatoes (and sometimes other potato dishes) are a common Whole30 compliant restaurant side dish, so keep an eye out for these! Obviously you’ll have to pass on the sour cream and butter. Eggs. Eggs are an easy dish to keep compliant with, but you’ll still need to do your due diligence. Make sure no milk or pancake batter is used in egg dishes (which some places use to make eggs more fluffy). You can also ask specifically for shelled eggs to make sure you’re not getting egg substitutes or beaters. Poached eggs are a pretty good guarantee since they’re just made with eggs and water. Omelets with veggies and meat are good so long as you’re getting real eggs – ask and make sure! These tips will cover the essential info you need to keep in mind when it comes to eating out Whole30-style. Prepping Beforehand. Be sure to check out restaurant menus before visiting to see what meals you can choose from to be the most Whole30 friendly. First, browse menus online and look for any dishes and sides that look compliant. Also take note of any special policies, such as no substitutions, as these could be problematic. Next, go ahead and call the restaurant to learn about their cooking oils and fats. 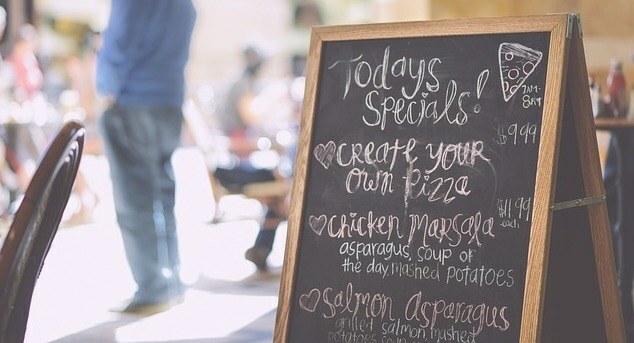 Find out if the have an allergen of gluten-free menu. The more knowledge you can get beforehand, the better. That way when you’re there, you can be an already informed eater which can help cut down on some of the questions you’ll need to ask the server. BYOD (Bring Your Own Dressing). If you’re not sure what the dressing options will be at restaurants you’re heading to, go ahead and pack your own Whole30 salad dressing to bring with you. Most restaurants won’t mind. If you want to use a restaurant dressing, stick to the simple oil + vinegar dressing. Don’t Slack on Substitutions. Don’t be afraid to ask about substitution options – switch out sandwich buns for lettuce, or ask for steamed veggies instead of fries. Ask About Olive Oil. Ask if veggies can be steamed or sautéed in olive oil instead of vegetable oil. Say Thanks And Be Appreciative. Be sure to thank the chef and server if they work to cater to your needs, and consider tipping a little extra. Be sure to show appreciation for your server’s help and be polite with your questions. Look For Grass-Fed, Farm to Table. Restaurants that serve grass-fed meat and focus on farm to table eating will be much more likely to cook the healthy way and will probably be more open to playing with the menu and ingredients to cook you up something compliant. Avoid “Crispy” or “Battered.” These are code words for fried-and-definitely-not-Whole30-friendly. Instead, look for foods that are steamed, broiled, grilled, braised, etc. Make sure to also ask seasoning or sauces used in the cooking process. Look For a Gluten-Free Menu. Some restaurants offer a gluten-free menu, which can be a great jumping off point for staying Whole30 compliant while eating out. You’ll still need to be careful about grains and dairy, but looking at a gluten-free menu weeds out a lot of problem ingredients and can be helpful. Dealing With Company. If you’re out with friends and family who give you quizzical looks over your eating choices, give as few details (or as many) as you feel comfortable with. I often found myself telling people that I was eliminating certain foods from my diet to gauge possible food allergies, and most seemed pretty content with that answer. Manage Expectations. Cheaper places will be less likely to jump through hoops, so you’ll eat pretty plain. However, higher end restaurants are usually better about catering to olive oil and other needs. Avoid The Rolls. Many restaurants serve tempting bread rolls – avoid these like the plague! Ask your server to not bring them to the table, send them back, or if you’re with bread-loving company, keep that bread basket on the other side of the table! Focus On What You Can Eat. Don’t get down about the french fries and bacon mac and cheese that you can’t eat. Instead, focus on what you can eat and give yourself a pat on the back for sticking to your guns! The Whole9 Guide to Navigating A Restaurant Menu. This article from the official Whole9 team. It shows what types of cooking processes to avoid and which to embrace, plus more info on how to prep for Whole30 dinning out. Do you have any Whole30 restaurant tips for eating out? Share your advice in the comments! 15 Whole30 Brussels Sprouts Recipes: More Bang For Your Brussels! 13 Whole30 Kabob Recipes: Fire Up That Grill & Get Cookin’! Panera’s chicken has sugar in the marinade, and I would be shocked if Subway’s deli meat was at all compliant. I have no idea about many of the other options you mentioned (Except Chipotle. Their carnitas is safe as you stated.) My point is, you must check with the place yourself, and check every time as recipes change sometimes. Cheers. Thank you for letting me know, I compiled a lot of this info from other blogs, but I see now I’ll have to re-examine the info. Thanks for the heads up! You’re right about the Panera and Subway meats – I’ve updated accordingly. I appreciate the feedback – a lot of the info here I received from outside sources. I certainly want to avoid spreading misinformation and am regularly re-evaluating restaurants listed here based off of outside information, restaurant-provided ingredient lists, and what other users share. I agree that lunch meats are out. As far as the eggs – eggs are often compliant or can easily be made compliant by the cook. As I clearly stated, it’s always essential to ask and make sure. Unfortunately, none of Chipotle’s meats are whole-30 compliant as they use rice bran oil and sunflower seed oil. Per the Chipotle website, their pork carnitas is compliant. That’s the only meat, but at least it’s an option. Sunflower seed oil is OK (used sparingly, mostly for eating out occasions). Other meats use rice bran oil, which is a hard ban. Thank you Hanna! Always good to have some confirmation and more info from someone who works at Chipotle. The salsas at Chipotle have added sugar, so they aren’t compliant with Whole30. The ingredient list on their website for Chipotle salsa does not show sugar as part of those ingredients. I was just on Moe’s website and soy is listed as an ingredient on just about all their meats and veggies. I imagine they’re cooking them with soybean oil. Thank you, will update and remove Moe’s suggestion. Most of the foods on Whole Foods hot bar are cooked in or contain canola oil. Read ingredients carefully! Don’t assume that everything they offer is compliant. We do not have a policy prohibiting the use of GMOs within our food items. Our fried food items are prepared in soybean oil and almost all soybean production in the U.S. is GMO-derived. To obtain more information on GMO’s, please visit the International Food and Information Council at http://www.ific.org. So that means no fried food in soybean oil? I’d think we can ask for it not fried in soybean oil though? Is the meat for Jimmy Johns Whole 30 compliant? Most likely no – no deli meat is usually compliant, especially from a chain sandwich shop. I’m a driver for Jimmy John’s. Thanks so much for the info Ferret! Unfortunately, you can’t eat Five Guys Burgers either. Although the burgers themselves may be compliant, they are cooked in Peanut Oil. Five Guys burgers are not cooked in peanut oil….their french fries, however, are. I just ate there, and they cooked there burgers in nothing…I asked and watched!! Applebee’s no longer have the ribeye or MY Strip. I simply asked for my sirloin steak with just salt and pepper. They were happy to prepare it without soybean oil. Tandoori isn’t a great option either because it is marinated in yogurt before cooking. Thanks for your effort to try to give us some options to think about when we are on the road! The Soup Plantation is great in that you build your own salad. They have olive oil and red vinegar. They also have baked potatoes. You could bring a little ghee. For your friends there are several soups, spaghetti, breads, pizza bread, muffins and dessert. I recently ate at Applebee’s and tried to order the Herbed Salmon but it was not on the menu. Good job keeping the article up to date! Sometimes there is no choice but to eat out, so, any advice helps. Even if you have to make a choice between non-compliant and boring, YOU choose. Remember we are all adults! I’m sorry, but please don’t say you have a gluten or dairy intolerance if you don’t, just to get them to pay attention. Not only is this dishonest, it makes it really difficult for people with actual allergies to be taken seriously. Yaaas I agree. My cousin is celiac and people who claim to have an allergy and don’t is a HUGE pet peeve!! Just be honest and say you’re avoiding these ingredients! There’s nothing wrong with that. Cattleman’s Steakhouse has a fantastic salad bar with red wine vinegar and olive oil on it to use in place of the regular salad dressings. They even provide little plastic cups on the bar to premix your vinegar and oil in the proportions you like! Just skip the cheese, meat, pickled beets and other non-compliant items. Lots of good stuff to eat instead. Ask for your steak with no butter and plain baked potato (bring your own ghee. Ingredients: CHICKEN BREAST, WATER, CULTURED DEXTROSE*, CONTAINS LESS THAN 2% OF POTATO STARCH, SEA SALT, VINEGAR*, CULTURED CELERY JUICE*. * INGREDIENT TO PRESERVE QUALITY.